Hakan Akkaya (L) in a training session. the 26-year-old athlete is eyeing title in the 2020 Tokyo Paralympics. Sports helped Hakan Akkaya turn a new page in his life years after he lost two legs in a childhood accident. The 26-year-old athlete who took up amputee fencing six years ago, is the first professional amputee fencer from Turkey to compete in international events, thanks to special permission by Turkish fencing federation, which had not included amputee fencing in its branches before Akkaya applied for permission. Pioneering the branch in Turkey, the young fencer proved his metal in international events, garnering six medals since 2015. "Amputee fencing came a long way after I represented Turkey. Fencers in other branches achieved a lot too," he said, pointing out to Deniz Selin Ünlüdağ who became the first Turkish female fencer to win gold at the European Fencing Championship last year and İbrahim Ahmet Acar who became the first Turkish fencer to win a world title in 2017. Akkaya says he wants to maintain a "stable" performance and win medals in every event he competes in and credits fencing with turning his "messy" life around. The fencer, who hails from the northwestern city of Bursa, had his two legs amputated when he was electrocuted by touching power cables when he was three-years-old. "My life was a mess before I took up sports. I felt like I was disconnected from the world. Then, one day, I decided to change everything in my life. Only sports helped me to achieve this goal," Akkaya says. It is a common concern for the disabled community who are forced to be confined at home due to lack of employment and opportunities to socialize. 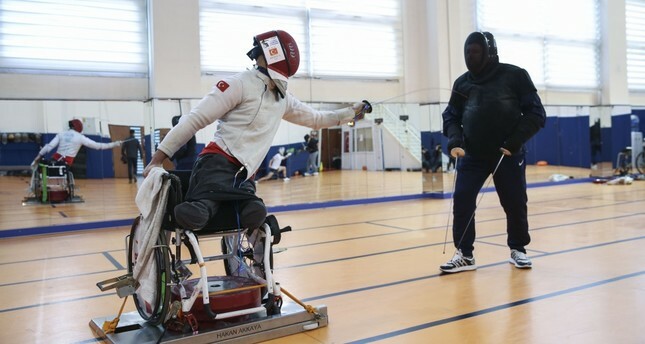 Hakan Akkaya heard that the local municipality had opened a training course for disabled fencers from a relative though he was unwilling at first to attend. "Finally, I decided to talk to the fencing trainer in the course and told him that I wanted to be the best if I was to take up fencing. You know the rest," he said. He started competing in international events in 2015 thanks to a permit from the Turkish fencing federation and won his first medal at an event in the United Arab Emirates that year. It was followed by one bronze and one silver medal in two categories at a championship in the Netherlands in 2016. Finally, he won his first gold in 2017 at a championship for U-23 fencers in Poland. He bagged one silver and a bronze medal in the same contest's 2018 edition. "I did what non-disabled Turkish fencers did by winning medals consecutively. I also saw more fencing courses opening in Turkey after my accomplishment. More disabled people started to take up fencing. I think they figured out how to overcome challenges after seeing an amputee athlete winning medal after medal. I had no training partner or a specific technique, but I am happy to be successful," Akkaya says. He now aims for a title in the 2020 Tokyo Paralympics as he trains for qualifiers. "I want to win a medal, be it gold or bronze. There will be 18 rivals in amputee fencing, and I am currently 14th in the standings. I can achieve more. I don't want to be a one-hit wonder," he says. Akkaya urges fellow members of the disabled community not to "give up trying." "You don't have to be an athlete like me. You can be a good writer, painter, anything, if you do not give up trying," he says.